I have been wanting to try making a Swiss Roll for ages and for some reason, I have been quite nervous of the rolling up part. They are known to crack if you aren’t super careful and follow the instructions to a T – no messing about with the steps here I’m afraid – except for the ingredients. I’ve had an idea for a chocolate Swiss Roll with Chocolate whipped Ganache in the centre, but most recipes you find on the web either don’t look appetising, i.e. like somebody really just tried making one for the first time and should perhaps have practiced a few more times before publishing it or they just haven’t matched what’s been in my imagination. Now that might sound a bit judgmental, it isn’t meant to be, but truthfully…do you want to spend time and ingredients on a recipe that doesn’t look like it came out perfectly? And after all, I claim that Chocolate Goose recipes are “tried and tested” to make sure I’m passing on the best. So yesterday I set about trying to find what I was looking for. Nada, nothing, not a sausage that fit my self-imposed brief so once again, I fiddled with the ingredients of a very simple one and it worked splendidly. 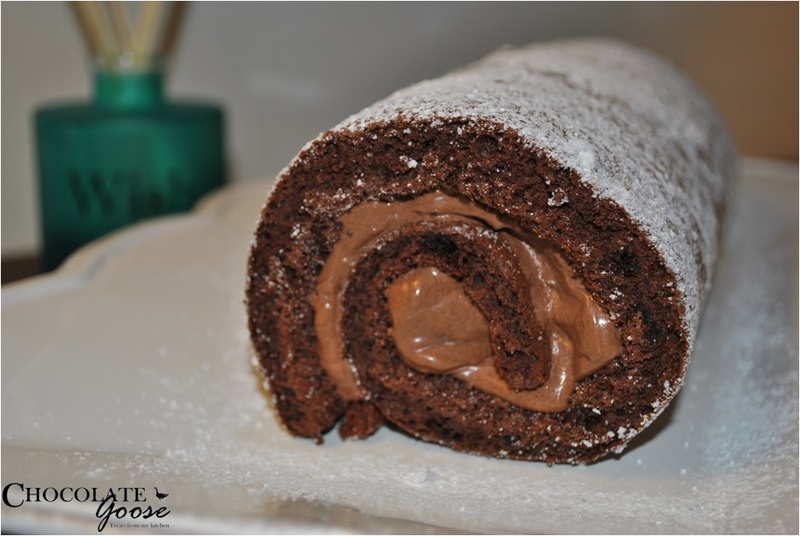 Traditionally, Swiss Rolls use only 4 ingredients: flour, eggs, sugar and the filling, normally jam. The recipe normally relies on the eggs and sugar being whipped to such a degree, that vast amounts of air are incorporated, which replaces the need for a raising agent, i.e. baking powder. There was a very simple vanilla roll with a strawberry jam filling which looked DIVINE, but I couldn’t get the chocolate one out of my mind so I’ve bookmarked that one to try at a later stage. I then found a recipe that asked for the egg whites and yolks to be separated. I was intrigued. The yolks and sugar are whisked together until they are light in colour but the mixture is lovely and thick – about 8 – 10 minutes of beating. The sifted flour is then carefully folded into the mixture – I was slightly alarmed at how thick this mixture was at this stage, but the next step sorts that out. The egg whites are whisked until they reach firm/stiff peak stage, but you don’t want to overwhisk them. Egg whites are then also folded into the mixture, a little at a time to break up the flour mixture and eventually it all comes together beautifully. I was therefore surprised to find that this recipe also called for baking powder, but I’m sure that with all that whisking you could actually leave it out. Given that the original recipe was also a vanilla one, I reduced the flour somewhat and replaced that with the equal quantity of cocoa (equal to what I had reduced the flour by). My experiment was working. The pan measurement also needs to be exactly as stipulated in your recipe of choice. If the sponge cake, which this effectively is, is too thick (i.e. the pan was too small), it won’t roll properly and may even unroll. If it is too thin (i.e. the pan was too big), it will definitely crack and could overcook. Thankfully I had just the right size pan on hand, 23 cm x 32 cm. You can either butter or spray the tray with baking spray oil and then lie a piece of baking parchment along the bottom. Trim it so it fits as well as possible. As I progressed through the various stages, I was surprised at how nervous I was when it came time to turn the cake out of the tray and then again when it was time to roll it up. Some recipes call for baking parchment while others ask for a damp clean tea towel. I used both (only my tea towel was dry, the “yuck” factor of a damp tea towel messed with my idea of perfection) and it worked a treat. The secret is to work quickly though. You need to remove the cake and roll it up as soon as it is finished baking and is still very warm and flexible so make sure you have everything you need already set out while the cake is still in the oven. Some recipes also ask that you sprinkle extra castor sugar over the dish towel or baking parchment and then flip the cake out onto that but I had visions of it flying out of the pan and breaking in a heap. You should do whatever you think is best, but I sprinkled the castor sugar over the cake while it was still in the tray and just after removing it from the oven. I then ran an off-set spatula around the edge of the cake to make sure that it wasn’t stuck to the side of the baking tray and then placed the new piece of baking parchment over the cake, followed by the dish towel. The last item to be layered was the cooling rack on the top. Using both hands and holding both edges (the tray and the cooling rack) firmly, I inverted it all very quickly and TaDa! I let out the breath which I hadn’t realised I’d been holding and checked to see it was all still ok, which it was. Removing the tray – gently – followed by the baking parchment on the bottom of the cake, I then sprinkled a little more castor sugar over this side of the cake before trimming the edges of the cake to remove any of the harder/drier bits that would negatively affect the rolling up. Some recipes call for you to score the edge of the cake were you plan to begin the rolling, but I chose not to do this, not wanting to cut too deep. Perhaps I’ll give that a try next time. And then the rolling begins. Keeping your whits about you and using both hands, gently but firmly roll the cake up inside the paper and tea towel and set it aside to cool. ELATION!! It had worked….so far. Later, once the cake has cooled and your filling is ready, carefully unroll the cake and add the filling. Too much and it will squish out the edges which wouldn’t look too good, unless that is the look you’re going for, but I wanted nice neat edges. Once all rolled up again, obviously minus the paper and tea towel, a dusting of icing sugar finishes it off nicely. Now go forth, Goslings, and conquer that Swiss Roll. It’s not as difficult as it pretends to be and I have to say, I am rather chuffed with my first attempt. I’d love to see yours if you want to post them onto the Chocolate Goose facebook page. Come on…you know you want to! Let’s see how many versions we can come up with :). Beat the egg yolks, gradually add sugar, beating until thick. Sift the flour, cocoa and baking powder together and fold into the beaten egg yolks using a metal spoon. Beat egg whites with the salt until stiff but not dry. Fold the beaten egg whites gently into the batter with a metal spoon. Line a 23cm x 32cm Swiss roll tin with greaseproof paper. Grease well and pour the batter into tin. Bake in a preheated oven at 180ºC for 15 to 20 minutes (please check from 15 mins as mine was ready to come out then). Turn out immediately onto a damp cloth sprinkled with Castor Sugar or follow my steps above, remembering to remove the drier edges. Peel off paper and roll carefully. Leave Swiss roll to cool in tea towel. When cool, gently unroll the roll and spread the filling, using an off-set spatula or the back of a spoon. Roll it back up again, as tight as you can. Dust lightly with sieved icing sugar before serving. Use two parts good quality bittersweet chocolate to 1 part full cream (weigh the cream – I’m serious – and then double the weight measurement for the chocolate to get the ratio for this type of ganache correct). Chop the chocolate up very fine so it melts quickly. Warm the cream to just below simmer (you can do the finger test and if you can hold your finger in it for 3 – 4 seconds, it’s just the right temp to melt the chocolate). Pour the warmed cream over the chocolate and stir gently until all melted and combined. You can pour it through a sieve to remove any lumps if you want it absolutely smooth, but as a filling, I don’t have a problem with the odd small lump of delicious chocolate. When combined and silky smooth, set it aside to cool to room temperature and thicken. When nice and thick, but not hard, whisk it until it is fluffy and light (in texture and colour). Use it as an icing or filling.